The fine print: All one-day workshops are *$35 for guild members, *$55 for non-members, *fees may change depending on workshop expenses. Workshop location, unless otherwise noted, is Trinity United Church Hall in Mahone Bay. Doors are open by 9:00 a.m. for set-up with workshops scheduled to begin at 9:30. We need a minimum of 12 participants to cover our costs; you must be prepared to pay when you register for a workshop. *May 23-25, 2019 - Workshops with Elaine Quehl - Workshops will be held at Trinity United Church Hall, our usual meeting spot. The two-day workshop “In Bloom” is scheduled for Thursday and Friday, the 23rd and 24th. 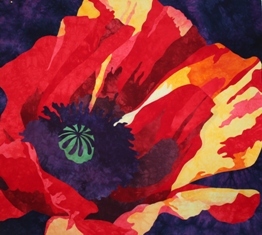 In the 2 Day “In Bloom” will be held on Thursday the 23rd and Friday the 24th workshop students learn to create depth & dimension & see value, while creating a stunning quilt using close up floral photographs. Choice of 2 patterns available: Peony or Poppy $ 16.00 each. Option of hand dyed fabric kit also available for purchase. The one-day workshop “Hosta” will be held on Saturday the 25th. The pricing will remain the same again this year at $35 for 1 day, $55 for 2 days. We are very fortunate to have this pricing still in place. In the 1 Day “Hosta” workshop students will learn Elaine’s method of layered applique to create a pair of Hosta leaves. Pattern $ 16.00 & option for hand dyed kit purchase available. In your brief email, let us know your preferences by numbering your workshop choices. You are welcome to register for both workshops; however, let us know your priorities in case we have more registrants than spaces. If there are vacancies, we’ll open registration to non-members on March 1st, 2019. Payment must follow at or by the next meeting date (March 4) to hold your place. The options: pay by e-transfer (see details under Finance News); in person at the meeting with cash or cheque; or send a cheque in the mail to Heather Sanft (813 Walburne Rd, RR 3 Mahone Bay, NS B0J2E0). You’ll receive a confirmation email with a supply list and some pre-class homework. If you’re not sure about the e-transfer process, please read the Finance News section above or contact our treasurer, Ann Phelan, at annphelan4@gmail.com for some assistance.